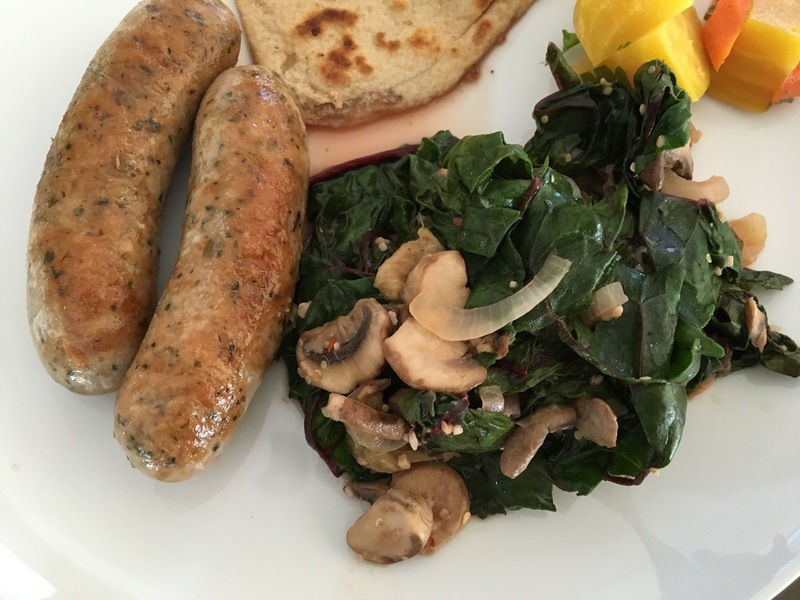 Savory Rhubarb, Wilted Chard & Sausage – Odds & Hens : Ramblings. Creations. So rarely is rhubarb unaccompanied by sugar, but this recipe pairs rhubarb with chard, spring onions, garlic and the like for a savory supper or side. Granted the amount of rhubarb isn’t enough to make a dent in the voracious plant you likely have but nonetheless. Thank you to my CSA for spurring me to action with the ginormous bunch of chard and spring onions. I used a NY times recipe as starting point to try out the combination and found it flexible, easy and not to shabby tasting. Hint is to just salt at the end with a quick taste as broth and sausage can have varying salt amounts making it harder to estimate and don’t fret over wine versus broth. Both will be delicious. This recipe serves 2-4. 1 pound of sausage links, or you could use eggs or both! All of this happens in a single pan or pot. Pierce the sausage, add a little olive oil and cook in a large pan until brown and cooked through. When done cooking, remove from the pan to a plate but leave the juicy bits in the pot. While cooking sausage, chop, slice and dice your vegetables: rhubarb stalks, chard, mushroom, shallots etc. After sausage is cooked, add the shallots, garlic and rhubarb and if you need it, a little more oil. Cook until soften and starting to brown. I used some of the rhubarb to scrub up the flavor bits off the bottom of the pan. Add mushrooms and cook until they start to soften. Again, add a touch more olive oil if you need it. Add the chili flakes if you want the heat. Add the mustard seeds here too. Add half the chard and half the broth and start to cook/wilt for just a few minutes. Add the remaining broth, vinegar and charge and finish cooking/wilting. Serve with sausage and any drippings from the plate, top with cheese if you like, salt and pepper to taste. Enjoy! Please share some of your favorite savory rhubarb recipes!